Social video experts Be On review the latest viral campaign by Newcastle Brown Ale. All hail the Queen of America! That’s what we might have said today if Britain had won the Revolutionary war. In its new ballsy campaign, Newcastle Brown Ale has fun with the idea, tying it in with Independence Day. After a successful Super Bowl ambush campaign earlier this year, the brand is back with another risky promotion. "If We Won", which was released ahead of the major holiday has a similar feel to the previous activation; it aims to provoke, but mainly, to create some laughs. The push kicked off last week with a video starring Brit comedian Stephen Merchant. 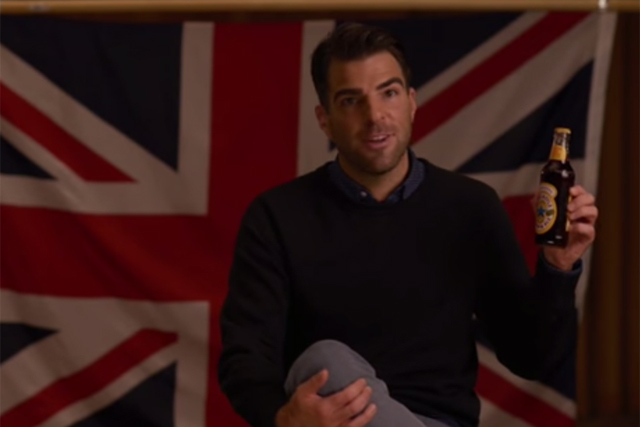 Multiple pieces of video content have been released since with the latest instalment featuring American movie star Zachary Quinto. The brand once again bets on a simple set-up that worked for it before: a famous actor, humorous lines and the actor’s ability to deliver them. Not a revolutionary concept but it works. This ad is definitely not the star piece of the campaign but Zach, who plays Spock in the newest Star Trek series, puts in a decent performance and just might encourage the audience to watch more videos from this promotion. What definitely seems to be missing is video seeding. The brand got it right with using a few big names to draw attention and producing a content series – a model that has been proved to generate long-term audience. But the success could be greater if the content was pushed in front of a wider audience. Newcastle Brown Ale is definitely a risk-taking brand when it comes to its advertising. It’s unclear whether its controversial approach will generate sales and popularity but its method will definitely create some online buzz.